The genus Nemesia is poorly known and in need of taxonomic revision. This species was described from material collected in south-western Namibia (Thellung 1916), and Steiner in Snijman (2013) indicates that it is endemic to Namibia. Two collections in the National Herbarium, Pretoria (PRE) from the vicinity of Vioolsdrif, eastern Richtersveld, may possibly be this species, but their identifications need to be confirmed. 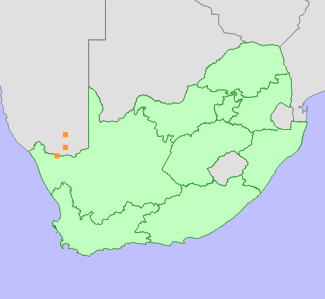 Southern Namibia, occurrence in South Africa unconfirmed. Reddish-brown sand with quartz pebbles. Snijman, D.A. 2013. Plants of the Greater Cape Floristic Region 2: The extra Cape flora. Strelitzia 30. South African National Biodiversity Institute, Pretoria. Thellung, A. 1916. Scrophulariaceae. In: H. Schinz (ed). Vierteljahrsschrift der Naturforschenden Gesellschaft in Zürich 60:404-414, Beiträge zur Kenntnis der afrikanischen Flora (XXVI).